Child Passenger Safety Week runs from the 18th through the 24th of September this year. Do you know how to choose the right car seat that fits your child, and can you tell when it’s time for a new one? The National Highway Traffic Safety Administration (NHTSA) promotes this week annually to help you to learn how, and finishes off the week with National Seat Check Saturday on the 24th. National Seat Check Saturday is a great time to evaluate your child’s car seat situation, and we’ve got some great information to help you do so. But before we talk about how to secure your child safely in your vehicle, let’s talk about why it’s important with a few numbers. The Centers for Disease Control and Prevention (CDC) reports that 638 children age 12 or younger were killed in automobile accidents in 2013. That’s a lot of heartbreak and tragedy in one year, and some of it may have been preventable. Of those 638 deaths, 38 percent of the children were not secured—that’s over 240 lives that may have been saved. For infants age 0-1, a car seat can decrease the risk of death by as much as 71 percent. For toddlers age 1-4, using a car seat decreases risk by 54 percent. 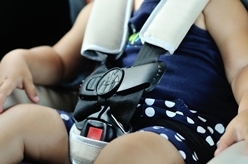 For children age 4-8, using a booster seat and seat belt reduces the chance of injury by nearly 50 percent. For children over 8, using a seat belt reduces the risk of death by about 50 percent. These statistics clearly show that securing your child can literally be a matter of life or death, so always be sure that he or she is properly seated before you ever leave the driveway. Currently, California law states simply that children under age 8 must be in a car or booster seat located in the back seat. However, this law has recently been updated, with the change taking effect on January 1st, 2017. The new law states that children under 2 must be in a rear-facing car seat, unless they weigh over 40 pounds or are over 40 inches tall. The child must be within the seat manufacturer’s specifications of height and weight, as well. Check your car seat tags or owner’s guide and plan for an upgrade if you need it. Up to age 2, use a rear-facing car seat. Using this type of seat helps prevent spinal injuries that can paralyze, or even kill, infants in a car crash. For ages 2 through 5, use a forward-facing car seat. Once your child has grown up enough to be able to support his or her head and neck properly, you can move up to this type of car seat. For ages 5 and up, use a booster seat with a seat belt. Booster seats ensure that the seat belt fits properly across the child’s body until he or she is big enough to fit without it. After your child outgrows the booster seat, buckle up. If the seat belt is across the child’s stomach or the shoulder strap is across his or her neck, the child isn’t yet grown enough to fit without a booster seat. All car seats must be installed in the back seat of a vehicle, unless the vehicle has no back seats or a car seat absolutely cannot be installed in the rear by design. A front seat installation always carries a higher risk of injury, but it’s better than not using a car seat at all. You also absolutely must be able to disable the passenger-side airbag for a child in the front seat, as the force of an airbag impact can crush a child instantly. You don’t have to wait until National Seat Check Saturday to make sure that your child’s car seat is the right size. If you’re unsure or would like some help, there are even places where you can go for inspection and installation assistance, and it’s often completely free. You can also register your car seat with the NHTSA to receive safety updates and information about any recalls on your particular model of car seat. It’s well worth your time, and could save your child’s life. At Steinberg Injury Lawyers, we hope that you and your children always travel safely, but we know that the road can be unpredictable. We have over 34 years of experience with automobile accident and injury claims, and we’re here when you need legal help. If you’ve been in an accident and would like to talk to us about your legal options, please call us for a free case evaluation at 800-989-6385, day or night. It would be our honor to serve you. From everyone at Steinberg Injury Lawyers, drive safe and have a great month. How Can I Protect My Child From Being Hurt by an Airbag?